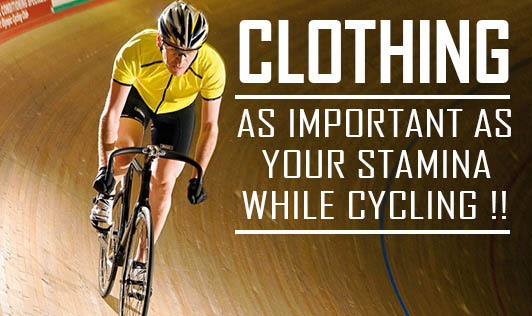 Clothing, as important as your Stamina while Cycling !! Helmet: This is the most important of all gears to be worn while cycling to keep you safe. Shirts/Jerseys: The jerseys or t-shirts should provide comfort, and should fit you well to allow free movements while riding. Choose a material which will help to maintain a comfortable body temperature. Most brands also provide pockets in the jerseys or jackets, which are useful to keep your belongings like keys, cellphone, and food packets. Shorts: Cycling shorts are designed to provide good support to your legs while riding. Lycra stretch shorts provide utmost comfort while doing spinning movements. These shorts also come with padding for protection while riding. Shoes & Socks: The cyclist must wear shoes as well as socks, especially to cover the ankles. Wearing only shoes without the socks is not recommended. Your shoes must not be too tight, as it might adversely affect the blood circulation to the feet. The fitting should be comfortable to you. Gloves: Gloves are very important for cyclists as they provide comfort, warmth during winter season, and protection too. The gloves should fit properly around your palm and should be a little loose around the fingers for free and comfortable movements. Apart from all the above things, you need to have a good pair of goggles to protect your eyes from dust. This is especially important for the cyclists wearing contact lenses. During the winter season, you should wear warm undershirts, long gloves, and a head band to protect yourself from cold. Using all the above things will not only make your ride comfortable, but also protect you from cold, dust, injuries, and to a good extent falls too. Be Safe and Enjoy your Ride!